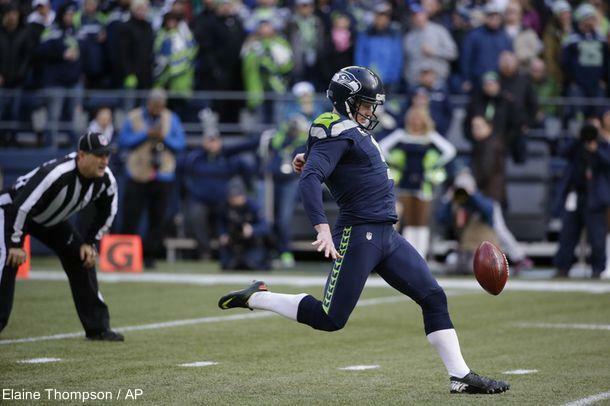 Jon Ryan made a name for himself during the NFC Championship Game, proving that punters can be quarterbacks when called upon. Now, he faces a skilled New England Patriots squad that features a dynamic returner, exceptional blockers, and a varied scheme that has baffled two of the league’s best punters in New England’s most recent games. Chuck Zodda breaks down who should come out on top. Jon Ryan’s path to the NFL looks like what happens when you give a three-year old crayons, a coloring book, and tell him to stay inside the lines. Weirdness is a naturally-occurring phenomenon in specialists, but Ryan’s travels take him beyond the bounds of normal, even for that unique group. To start, Ryan never played college football, at least not in the sense that most fans are familiar with it. After growing up in Regina, Saskatchewan, Ryan attended the University of Regina, where he played both punter and wide receiver for the Rams. Ryan actually led the squad in receiving during his sophomore season, along with standing out as a punter. To attempt to equate this to any level of NCAA competition is largely useless, but it is nowhere near FBS-quality. After graduating, Ryan didn’t meet the sniff test of NFL scouts, and was skipped over in the 2004 NFL Draft. Taken instead during the third round of the CFL Draft (24th overall), Ryan spent two years punting for the Winnipeg Blue Bombers and generally dreaming about getting out of Canada. His 50.6 yard average in 2005 caught the attention of the Green Bay Packers, who decided to take a chance on the product of the Canadian plains, signing him to a contract in January of 2006. Ryan spent two years in Green Bay before agreeing to terms with the Seattle Seahawks during Week 1 of the 2008 season. Ryan hasn’t looked back, holding down the Seattle job for the past seven years and providing remarkable consistency for their punt unit. Oh the surface, Ryan does not appear to possess a strong leg, grossing just 44.1 yards per kick this season, good for 27th in the league and a full yard below average. However, Ryan landed 45.9% of his kicks inside the 20-yard line, the highest percentage in the league, and forced fair catches on 36.1% of his kicks, good for third in the NFL. Ryan’s strength lies in hang time, as he launches at a much steeper angle than many of his competitors, sacrificing distance in the process. Ryan can generate hangs of 4.6 to 5.0 seconds on a regular basis, elite for the position. Unlike directional punters such as Pat McAfee and Sam Koch, Ryan utilizes a more traditional approach. While McAfee and Koch target the boundary, Ryan takes aim at the left numbers, hitting the target on 41% of his kicks. An additional 21% of his punts fall between the left numbers and left hash, meaning that Ryan lands 62% within an 11-yard slice of the field. This speaks to an outstanding focus and dedication to his craft. Ryan is able to hit this mark regardless of his location on the field. However, against the New England Patriots, this is likely to be a liability for a number of reasons. 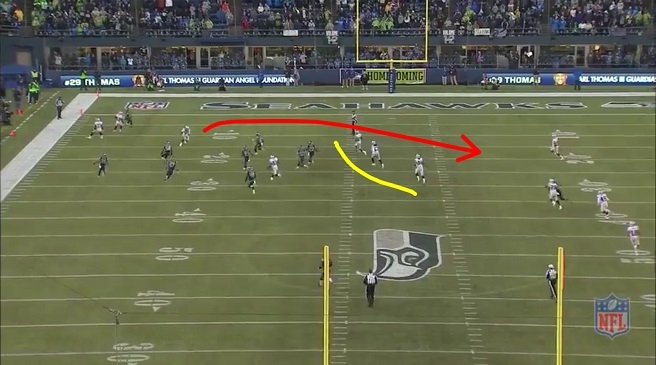 The Seahawks struggle against teams that employ directional return schemes. Amazingly enough, the Oakland Raiders provided the blueprint for beating the Seattle coverage team earlier this year with an effective wall return. Oakland shows seven men near the line of scrimmage, with Jonathan Dowling (#41) dropping away from the line just before the snap (this is a tactic also employed by the Patriots, who utilize Danny Amendola in a similar fashion). 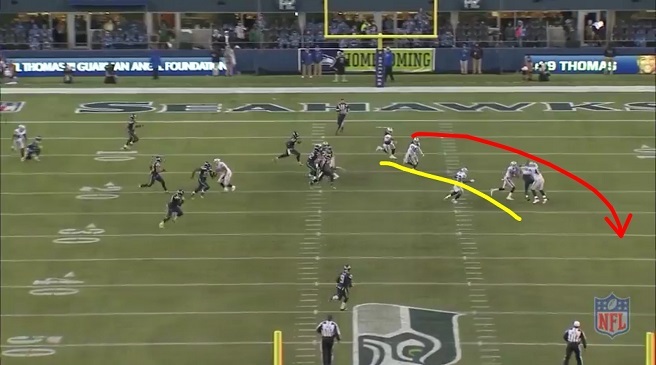 On the left side of the line, three Raiders (yellow arrows) bring pressure, forcing their blocks towards Ryan. Their goal is not to block the punt, but rather to hold their men up and get in position for the eventual return. 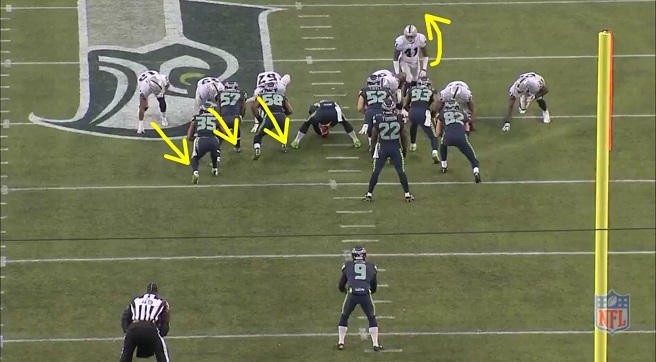 Seattle appears to get off the line efficiently, with most of their players unimpeded by Oakland blockers. However, this is by design, as the Raiders are aware of Ryan’s kicking tendencies. They essentially give up the left side of the field where Ryan typically lands his punts. 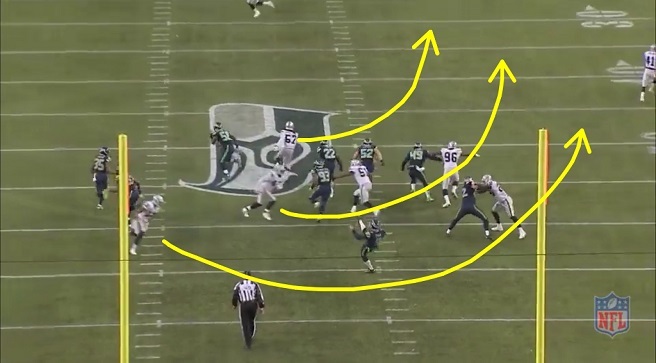 Instead, the three Oakland linemen (yellow arrows) peel around to the right side to set up a wall return and use Seattle’s aggressiveness against them. Moore catches the ball just outside the numbers, exactly where he and the Raiders expected it. He immediately plants his foot and cuts hard to his left, leading the massive Seahawk attack party into his line of blockers. The destruction waged on Seattle’s defenders is devastating. 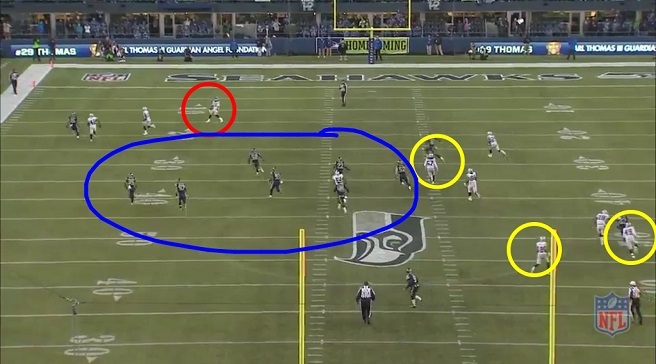 The entire Seahawk defense is now trapped on the back side of the play and Moore breaks for open ground. He is eventually wrestled out of bounds after picking up 23 yards. This gave the Raiders in prime field position, and the typically-inept Oakland offense was able to put seven points on the board, in large part due to the setup from this return. Seattle features a capable unit with an above-average punter in Ryan, but their consistency can be attacked by teams that deploy directional returns. Unfortunately for the Seahawks, the Patriots are capable of scheming for anything, and Part 2 of this preview will look at how they can attack the Seattle punt squad. Follow Chuck Zodda on Twitter @SOSH_ChuckZ. Chuck Zodda knows the importance of staying in your lane, how to fake a punt return, thehumanity of punters, proper placekicking technique and the Jets.